You don’t need a fancy car. The insurance would be outrageous after all. A million bucks? The taxman is flush enough already. A Hollywood star on speed dial? No one bothers to call anymore. But a mother-in-law who takes your side in a squabble with her own child? Why, as Lou Gehrig said, that’s something. That makes you the luckiest person in the world. Chardonnay is the most planted grape in the world, and for good reason. It is incredibly diverse. A Chardonnay that has been oaked is pure comfort in a glass. 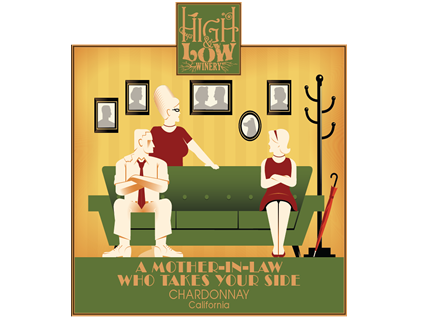 Just like a mother-in-law who takes your side in an argument, our oaked Chardonnay is a pleasant surprise in how it hits all the right notes – butter, pie crust, coconut. We find that our oaked Chardonnay pairs well with soft cheeses, poultry, or chicken. Or pair it with whatever you prefer, or with nothing at all! At the end of the day we like to say, Drink it, don’t overthink it.